" Our target is to plant one million trees in South Jakarta"
South Jakarta Government is cooperating with PT. PLN, to plant 3,600 productive, protective and rare trees. South Jakarta Mayor, Marullah Matali stated, planting is done simultaneously in 56 urban villages in South Jakarta today. "Our target is to plant one million trees in South Jakarta. 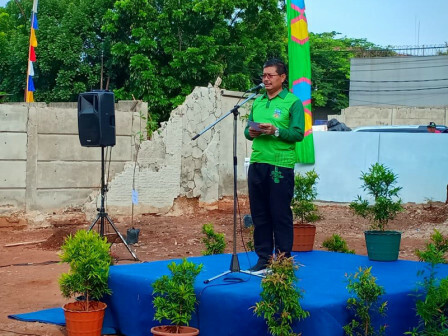 It becomes South Jakarta Government real effort to green and maintain air quality in Jakarta," he mentioned after symbolically planting a tree at Bintaro West Park, Jalan Bintaro Taman Barat, Bintaro Urban Village, Pesanggrahan, Tuesday (12/18). Meanwhile, South Jakarta Spatial Planning and Environment Division Head, Bambang E. Prabowo said, 2,400 protective trees are from Forestry Dept., 1,000 productive trees are from South Jakarta KPKP Sub-dept., and 200 rare trees are donated by PT. PLN. "We have rare trees such as Cipedak, Menteng, and Kecapi. Then also Rambutan and Mango for productive trees," he conveyed.